A good night’s sleep is vital for the health of both your body and mind. One big key to sleeping well is a supportive, comfortable mattress. Many people prefer the feel of a memory foam mattress. Memory foam was originally invented at NASA. From there, the medical industry quickly found a variety of uses for this material. Today, memory foam is very popular in the consumer market. You can find memory foam in bed pillows, travel pillows, mattresses, mattress toppers and more. Memory foam is a synthetic material that conforms to whatever weight is placed on top of it. The foam can distribute the pressure evenly. This leads to greater support and comfort than practically any other mattress fill. Memory foam uses body heat to perfectly contour your body. Some memory foam mattress toppers capture too much heat that makes the mattress hot. This is why you want open cell memory foam. This type of foam allows for improved airflow and an overall cooler bed temperature. First, memory foam is very comfortable. The flexible, cushioned material provides a soft place to rest. The foam cells compress as they reform, which allows the mattress to perfectly adjust to bodies of any size or shape. Memory foam has quite a few advantages over other fillings. Memory foam promotes natural spine alignment. This greatly reduces your chances of waking up with a sore back, limb pain or other muscle issues. Because the foam elevates your head while you sleep, it also helps reduce snoring and sleep apnea. Allergies are also reduced because the polyurethane foam is inorganic – which means dust mites stay away. Memory foam is great for couples, too. The foam is firm enough to contain any fidgeting or motion. Plus, the foam is so comfortable you’ll find yourself tossing and with far less frequency. Overall, memory foam helps you disturb your partner fewer times throughout the night. One major reason more people don’t have a memory foam mattress is cost. A complete memory foam mattress can run hundreds or even thousands of dollars. Fortunately, a mattress topper provides most of the benefits of a memory foam mattress for significantly less. The topper fits over your existing mattress. Most toppers are designed to work with your existing fitted sheets and other linens. This is especially true with two-inch memory foam mattress toppers, which provide enough thickness to be comfortable but not so much that you have to buy a new set of sheets. Density – This determines the level of support the topper provides. A density of six is one of the highest while a density of two is usually the lowest. Heat Sensitivity – Memory foam reacts to body heat. Ideally, the surface will be softer wherever there’s a higher temperature. If the spacing in the foam is too close, the mattress topper can be unpleasantly hot. This is why you want memory foam with an open cell or similar structure. Proper ventilation ensures the topper stays a comfortable temperature all night long. Cleanliness – A clean mattress promotes good health. Memory core mattresses are inorganic, which means dust mites don't stick around. You also want a topper that has an easily removable cover or is otherwise stain resistant. Smell – There's a downside to memory foam products. They often have a weird odor. The solution is to buy a topper that has been aired out. Many quality manufacturers wait about three days after manufacturing a topper before they ship them to customers, which eliminates any awkward smell. The Lucid mattress topper is made of 100% polyurethane memory foam with a three-pound density. This topper molds to your body and provides support for a variety of pressure points. This lets the foam topper provide proper alignment for your spine, improve your body's circulation and reduce muscle pain. The unique memory foam is resistant to allergens and dust mites. With open cell technology, the topper is durable and resilient. The foam provides support but doesn’t allow for long-lasting body impressions. This helps you avoid getting stuck in a literal rut during the night. The topper is also ventilated. The increased space between cells optimizes air flow. This is one of the coolest mattress foam toppers on the market. There's nothing quite like testing out a mattress topper for yourself. Fortunately, Linenspa provides a three-year warranty. Try the topper out on your bed with no risk. This two-inch memory foam topper fits an extra-long twin mattress. This is the length of the bed in a typical college dormitory. Since it's often impractical to bring your bed to college, this is the perfect solution for college students looking for a great way to sleep well all year long. The mattress is made of 100% polyurethane memory foam with a density of three pounds. This is a medium-firm mattress. 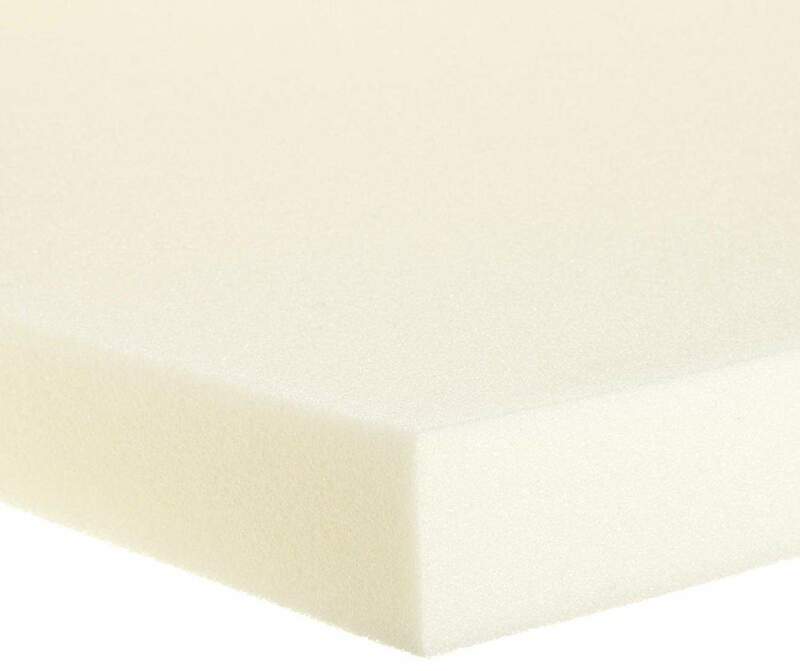 The Surefoam memory foam has improved airflow that results in a neutral surface temperature. The mattress is naturally hypoallergenic with antimicrobial finish. Dust mites have no interest living in the inorganic foam. This topper is 80 inches long by 39 inches wide and two inches high. Sleep Innovations is proud to be an American company. There's a one-year limited warranty. The topper is 11.9 pounds when shipped. After opening the topper for the first time allow up to 72 hours for the foam to fully expand into the proper condition. This mattress topper doesn’t just feel good. Purchasing one allows you to do good, too. This is the only mattress topper made with plant-based ingredients, which is a big plus for the environment. Also, this topper is made with pride in the U.S.A. The Visc02 ventilated memory foam is breathable, comfortable and provides plenty of support. The visco-elastic foam relieves pressure points. However, the foam is firm enough that you won’t create a deep impression in the bed during the night. Unlike many other memory foam products, the Sleep Joy Visco02 is odor neutral. You don't need to air out the topper before use. Clean-up is easy, too. You simply spot clean with a damp cloth. While all memory foam mattress toppers provide health benefits, the Sleep Better visco-elastic mattress positions itself as a therapeutic solution. This topper is frequently used in hospitals. Homebound patients, the elderly and pregnant women are also fans of this topper. As befitting a topper used in therapeutic settings, the Visco Topper is durable and easy to clean. Simply spot clean with warm water and soap. The topper comes with a five-year warranty, so you can try it out on your bed risk-free. The pad measures 58 inches by 77 inches by two inches. The density is 2.5 pounds per cubic foot. The open cell foam keeps the mattress cool all night long. You’re never too young to enjoy the benefits of a memory foam mattress topper. The Milliard topper is for cribs and toddler beds. The topper is 52 inches by 27 inches by two inches. Your existing standard-sized sheets will still fit even with the topper in place. As all parents know, babies and toddlers can be messy. This mattress topper is ready to handle any mess. Each topper includes a removable 65% cotton zipper cover. This cover offers waterproof protection and is also machine washable. Milliard memory foam is CertiPUR-US certified. The two-inch thick foam is high quality. The topper won't lose shape or create a deep indentation. The topper is hypoallergenic, non-toxic and completely safe for babies and young children. Whether shopping for yourself or a child, there are plenty of high quality two-inch toppers that are comfortable, supportive and inexpensive. A topper lets you drastically improve your quality of sleep and your physical health – without having to buy a new bed. It’s time to get a good night’s rest.